There are ways that you can improve the interior of your kitchen. Your kitchen should be a welcoming place for your family and friends. A room that you can entertain your guest. Your kitchen should be a place that you can use for different purposes such as preparing and cooking meals, entertaining family and friends, and dining. Your kitchen should have large appliances as well as small kitchen appliances. Your large kitchen appliances can give your kitchen a newer updated look. And can also improve the look of your kitchen interior. When choosing a color for appliances pick out a color that you will be happy with, because appliances tend to last a long time before wearing out. Matching appliances will look good in any kitchen. You should have several small appliances in your kitchen such as a coffee maker, toaster, blender, mixer and microwave oven just to mention a few. These small appliances can make preparing meals simple and less time consuming. 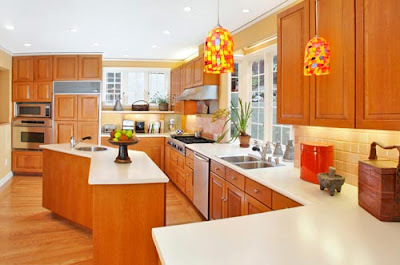 There are other ways that you can improve the look of your kitchen interior. Adding a new counter top will improve the overall appearance of your kitchen. There are beautiful counter tops on the market now days that can give your kitchen a whole new look. Granite counter tops are especially popular for the rich look they can give to your kitchen. Painting you kitchen walls is important to brighten up your kitchen area. Just adding a coat of paint to your kitchen walls can improve the interior of your kitchen. Adding new flooring to your kitchen is another way to improve your kitchens appearance. There are many types of kitchen flooring. Some popular types that people like are hard wood flooring and ceramic flooring. These types of floorings are very durable and long lasting. Cabinets can improve your kitchens interior. Your kitchen cabinets are one of the first things people will notice about your kitchen. People like natural wood grain cabinets with complimenting hardware. These types of cabinets are used in many kitchens and are beautiful and easy to care for. Other items that will compliment your kitchen interior are the accessories that you add to your walls such as pictures, shelves, clocks and other decorative accessories for your kitchen. Some kitchen that don't have enough cabinet space can add a kitchen cupboard to make more room for dishes pots and pans. These are just a few of the ways that you can improve your kitchen interior. And make your kitchen look its best.